Sunday, 12:15pm: The driver of the white Commodore which flipped onto its roof at Benaraby yesterday has been charged with drink-driving. The 21-year-old West Gladstone man was taken to Tannum Sands police station after the crash, where police will allege he recorded a blood-alcohol content level of 0.066%. 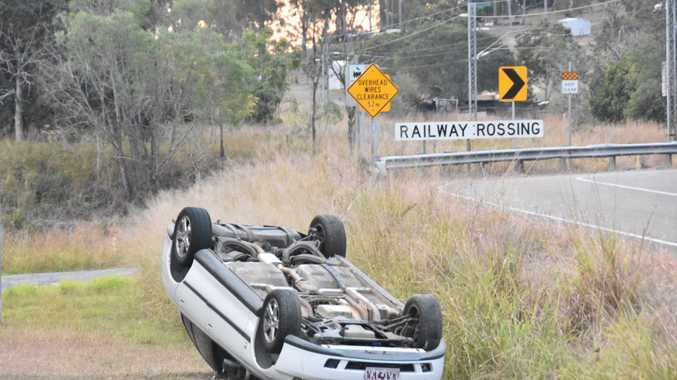 Saturday, 5.39pm: A YOUNG man believed to be the driver of a white Commodore which flipped onto its roof at Benaraby this afternoon has left the scene in the back of a police car. Emergency services are on the scene of the crash at the moment near the rail crossing on Awoonga Dam Rd. The car is believed to have left the road while navigating a sharp bend and has landed on its roof down a small embankment. The car had two male occupants at the time of the crash but neither of the men was injured. Police were notified of the incident at 4.35pm. Matthew Maddin, the owner of the car and a passenger at the time of the crash, told The Observer that the sharp bend in the road contributed to the accident. Passenger blames corner: Matthew Maddin blamed the corner on Awoonga Dam Rd for the crash. "It's just the corner. The corner's a s*** corner," he said. "I've had a mate that's even rolled his HiLux on that corner as well just doing his own thing." Fire fighters have made the scene safe and the wrecked car is now the responsibility of the owner to organise towing.